But Apple's press team seemed to like the idea of talking about the green innovations in their new building, especially if the story would have presence on NPR. We proposed that angle for its connections to science. A tour was granted and on a sunny day in February, I found myself squeezed into an Apple Jeep with Dan Whisenhunt, the company’s VP of Real Estate and Development, and Lisa Jackson, who was appointed by President Obama to head the Environmental Protection Agency, and left in 2013 to become Apple’s VP of Environmental Initiatives. Our first stop was a scale model of the new campus. 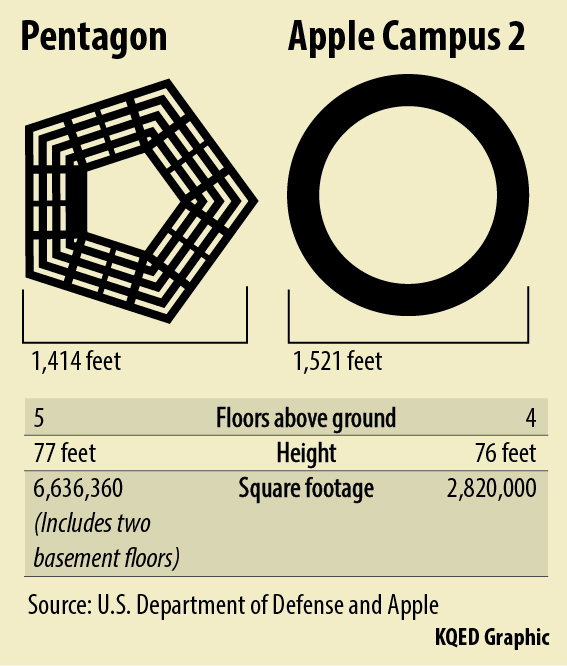 Known as “the spaceship” – or, if you prefer, the “donut” – the building will be a glass and concrete ring, a mile in circumference, surrounded by trees and rolling hills. Much of the new building will be sculpted from the remains of the former Hewlett Packard campus that used to be on site. Fifteen thousand people will work here. 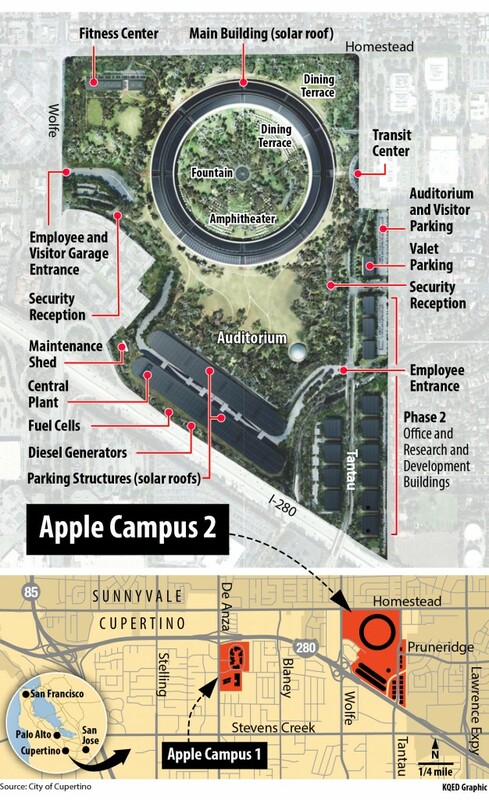 Former Apple CEO Steve Jobs oversaw plans for the campus. 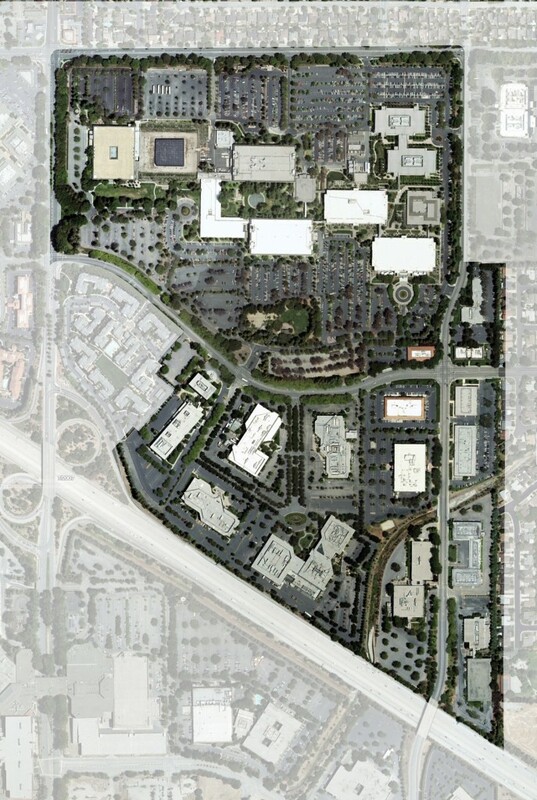 In 2011, six months before his death, Jobs appeared before the Cupertino City Council to win support for the project and show the city what it might expect. “Apple has grown like a weed,” he told the council. The company needed to build a new campus. "If we can’t, then we have to go somewhere like Mountain View,” Jobs told the council. “We’d take our current people with us. We’d give up, and over years sell the land here and the largest tax base would go away. That wouldn’t be good for Cupertino and it wouldn’t be good for us either." These buildings on the former Hewlett Packard site were ground down for use in the construction of Apple's new campus. Apple, says Rick Kitson, a city spokesman, is “unquestionably” the largest taxpayer in Cupertino. According to a 2013 economic analysis, the city took in $8 million in net revenue from Apple between 2012-2013, 18 percent of the total city budget. The company projected that if they built the new campus in Cupertino, net revenue from Apple would rise to $11 million. Apple stayed. 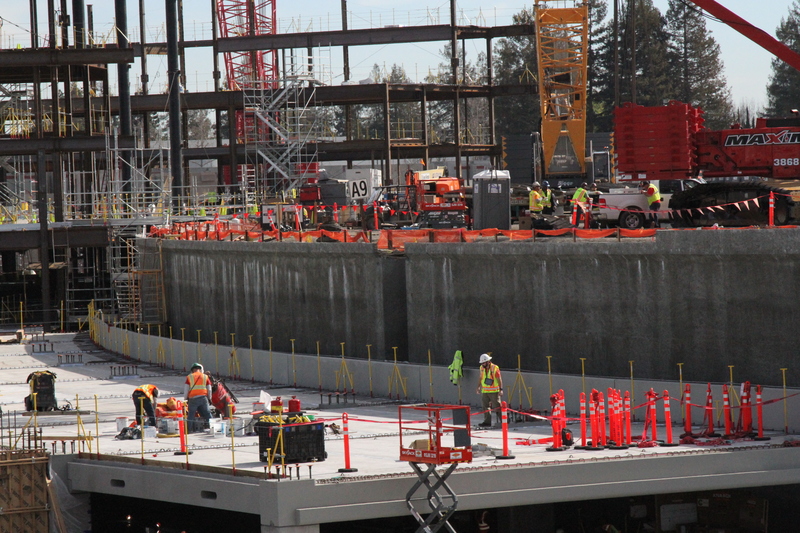 Today, its construction site, near I-280, is shrouded in intrigue. The site has become a magnet for amateur drone operators who fly over the campus on weekends, capturing sweeping aerial images of the vast construction site. I asked Dan Whisenhunt whether he’d watched them. He said he had, and that as long as the drones stayed off Apple’s property, it was the operators’ right to fly them. He didn't sound enthusiastic. “There’s nothing wrong with sharing progress along the way," he said. "But if it were our preference we’d like to share it in phases that are meaningful to us." Jackson and Whisenhunt were eager to talk about the campus' many green features. Two, four-story parking garages will carry a layer of rooftop solar panels, Whisenhunt explained. Jackson told me the campus will be powered mostly by electricity generated from solar panels onsite. 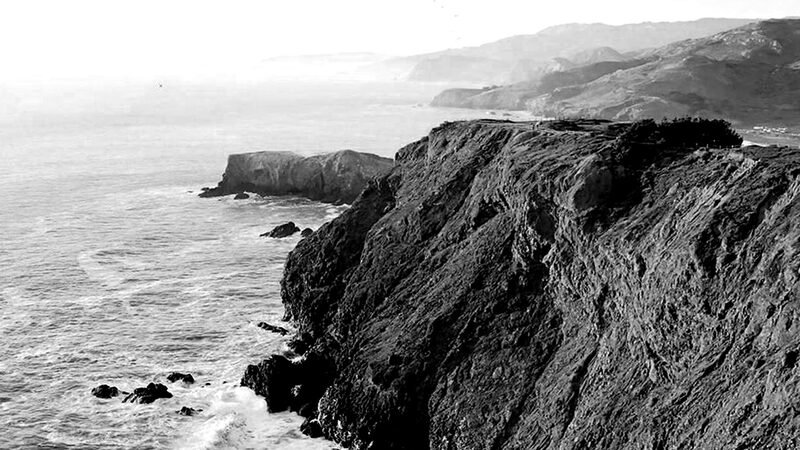 In a related endeavor, Apple CEO Tim Cook recently announced plans to build a nearly $850 million solar farm in Monterey County. That farm will produce enough electricity to offset the company’s 52 California stores, as well as its data centers and offices, Apple says. 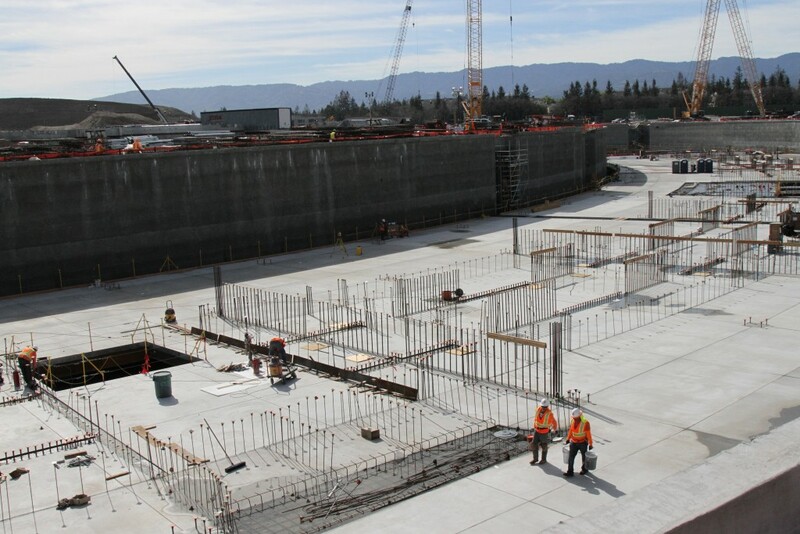 At the new headquarters in Cupertino, toilets, cooling towers and landscape irrigation systems will use recycled water imported from municipal wastewater treatment centers. Adjustable louvers on the exterior walls will control air flow through the building, says Jackson, so that employees will rarely need heat or air conditioning. And then there’s the on-site concrete plant. Whisenhunt says 95 percent of the old site – including HP buildings, sidewalks and other features, is being recycled onsite rather than trucked to a landfill. 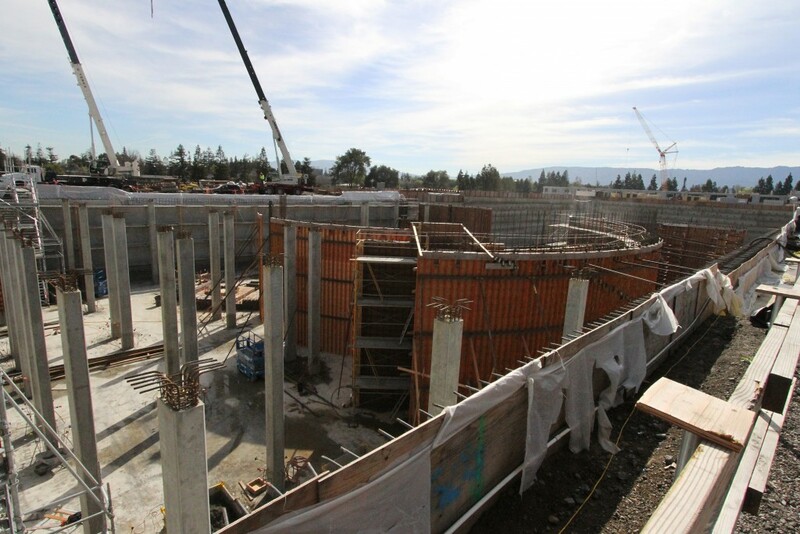 That material is being ground down and used to construct the large concrete pieces that serve as a frame for the new circular building. What's the budget for this project? Whisenhunt smiled. "We have one,” he said. About eighty percent of the new site will be open space, much of it forested. 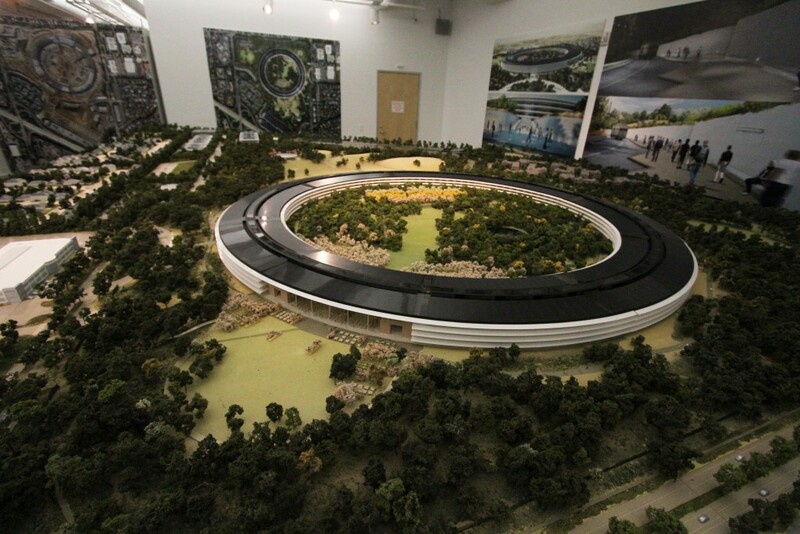 Standing in front of the scale model, Jackson remarked that while the building itself was beautiful, most striking to her were the thousands of trees that would eventually grow onsite, including some 6,000 mature trees that the company has been raising offsite and will eventually transplant to the campus. When I asked Jackson asked how much of that open space would be open to the public, Apple’s media hander signaled her not to answer. I rephrased the question. Whisenhunt replied that the campus will be surrounded by a fence. The campus will have a visitors’ center, the handler informed me later. Critics have called the building insular. Allison Arieff, an architecture critic for the New York Times, says there’s more to sustainability than solar panels and recycled water. It’s about engaging the community too. “They’ve definitely taken the approach of building as object, with not so much interest in anything else that’s happening apart from that object,” says Arieff. Critics have also asked why the company didn’t consider putting its campus into a downtown, such as San Jose’s, where it could revitalize underused areas and provide easier commute options for employees. Currently, 70 percent of Apple's employees commute by car, alone, says Whisenhunt. “This isn’t an office building,” Jackson says. “This is an R&D facility. Think of a national lab. Think of NASA. That’s the level of work that’s happening here." The new campus is expected to open in late 2016.